Loops, Glitches Raise Questions About Texas Dashcam Video : The Two-Way The dashcam shows police stopping and arresting Sandra Bland, who was later found hanged in her jail cell. Officials said the video was not edited, that the glitches occurred as the file was uploaded. 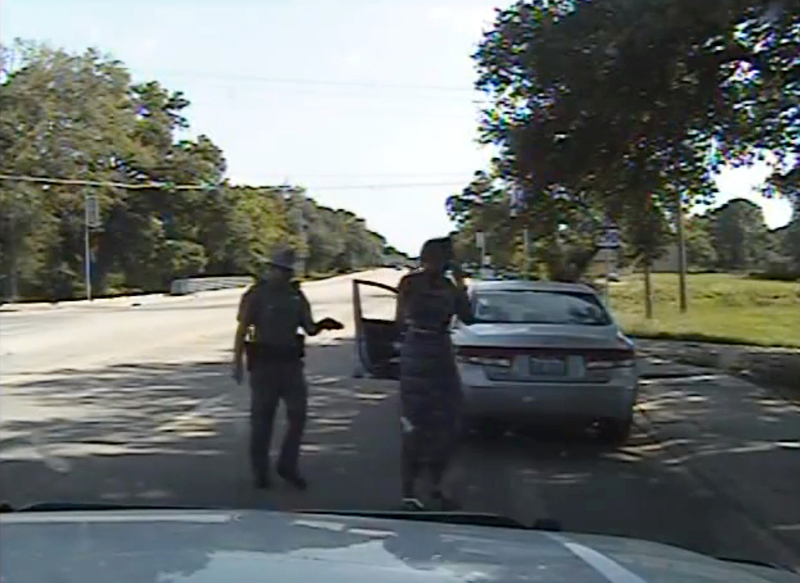 In this July 10 frame from dashcam video provided by the Texas Department of Public Safety, trooper Brian Encinia arrests Sandra Bland. Last night, the Texas Department of Public Safety released a 51-minute video showing police arresting Sandra Bland after a routine traffic stop. The thrust of the debate, of course, has been how that stop escalated into a full-on confrontation between Bland and Texas state trooper Brian Encinia. But the video is peppered with loops and glitches that have raised questions about whether we're seeing its entirety. This morning, a spokesman for the public safety department said the video had not been edited. "To eliminate any concerns as to the efficacy of the video DPS previously requested the FBI examine the dash cam and jail video to ensure the integrity of the video. The entire video was uploaded to include the audio and video of the conversation the trooper had by telephone with his sergeant, which occurred after the arrest. Some of the video during this conversation was affected in the upload and is being addressed. We are working to repost the dash cam video. (Meanwhile, a DVD of the video will be available to the media upon request later this morning.)" That part of the video shows a tow truck driver walk out of the frame and then, inexplicably, that same scene loops again while the audio continues seamlessly. The Los Angeles Times points to another part of the video, where the same cars appear to loop into the frame a couple of times, while the audio keeps rolling uninterrupted. It's worth noting that these questions about the video matter because they speak to the heart of this case: whether to believe an official account. Bland was taken to jail after that Friday stop. She spent the weekend there, and on Monday morning she was found hanged in her jail cell. The Harris County medical examiner ruled Bland's death a suicide, but her family has been disputing that finding from the beginning. "The local sheriff and other elected officials now say Bland disclosed the previous suicide attempt during a screening process at the jail in Hempstead, but the jailers said she didn't seem depressed. Instead, she was 'upset' about her arrest during a contentious traffic stop. Her family has maintained that she wouldn't have committed suicide, because she was looking forward to starting a new job in Texas." The Houston Chronicle has an image of the booking questionnaire that deputies filled out regarding her arrest.